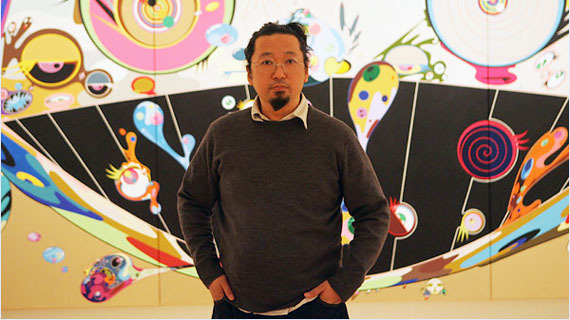 Japanese artist Takashi Murakami has made a name for himself by successfully drawing upon popular culture as a major influence — specifically in adapting aspects of manga and anime to his own artistic vision. In the process he revolutionised the commercialisation of art, creating a wide range of products that utilise his imagery and reflect his aesthetic approach. His work is playful, child-like and brightly coloured, yet dark and serious at times, at levels below its innocent surface. From fine art he moved into animation, and now — with the help and encouragement of experts in the field — he is planning to fulfil a long-held ambition: to re-invigorate daikaiju cinema in his own inimitable fashion. First conceived “over ten years ago as a full CG animated film” and subsequently dropped, the project has been reborn as a full-length live-action feature film. 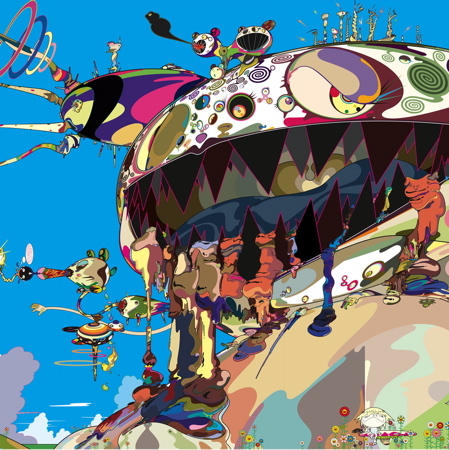 Titled Jellyfish Eyes, the film boasts the involvement of SFX make-up artist Yoshihiro Nishimura (Vampire Girl vs Frankenstein Girl, RoboGeisha, Monster Killer), who convinced Murakami that it would be possible to fulfil his dream and introduced him to screenwriter Jun Tsugita (Mutant Girls Squad), producer Mana Fukui, visual effects supervisor Tsuyoshi Kazuno (The Machine Girl, Onechanbara: The Movie, Ultraman Saga), and others, who have all been working on the project. Also acting as an FX supervisor is Kiyotaka Taguchi, who worked on Godzilla, Mothra and King Ghidorah: Giant Monsters All-Out Attack, Godzilla Against Mechagodzilla, The Grudge 2 and MM9. Like the original daikaiju film, Ishiro Honda’s seminal Gojira (1954; aka Godzilla), Jellyfish Eyes uses monsters as metaphors that focus on the consequences of disaster. Where Gojira was born from the trauma of the US nuclear attacks on Hiroshima and Nagasaki, Jellyfish Eyes draws upon the March 2011 earthquake and tsunami, which had its own nuclear aftermath. In the wake of 3/11, the damage sustained by Japan runs deep. We must all do our best to emerge from that shadow. It will require connections among people… more to the point, it will require the instinctive ability to spot opportunity and inspire trust. That is how our current team came together. While this is my feature film debut as a director, for Nishimura it is like a child. He seduced me and now we’re giving birth together. I am someone who often has trouble communicating with people. It is for that reason that I became an artist, the overwhelming urge to share my heart with those around me through my work. I feel that it is the same for all people who create for a living. We imbue our soul in our works, exhaust ourselves day and night, and it is only then that we obtain even a fraction of the social interaction that most people achieve. In the end, however, this is our only way to communicate with society. Though no images from the film have been released as yet, rumour has it that the live-action film features monsters that closely replicate in a “realistic” manner the style of Murakami’s other artistic creations. That alone should make it a wonder to behold! Despite being listed as “completed” on IMDb, inside sources tell us that the film is currently in post-production and the focus of the main FX is yet to be decided. So whether it ends up full CGI, old-school man-in-suit hands-on style or a bit of both has yet to be seen. You can bet that Undead Backbrain will be posting more on this exciting project soon! Source: via Avery Guerra; Official website; IMDb; Artinfo (who should be castigated for describing the original Gojira film as “clunky”); Hypebeast; Dorothy Santos. 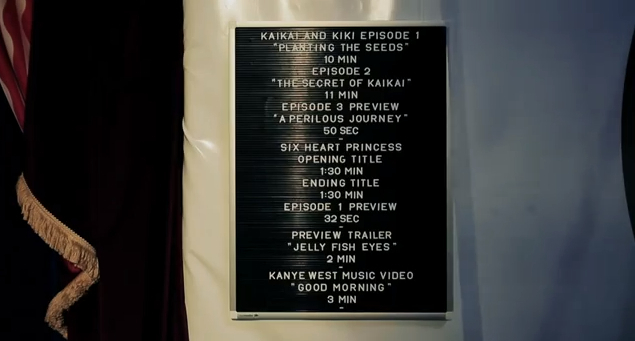 This entry was posted in Animation, Daikaiju, Film, Giant Monsters, Monsters in general, Pictorial art and tagged daikaiju eiga, Ego art exhibition, Giant Monsters, gojira, Japan, Kaikai and Kiki, live action giant monsters, Takashi Murakami, tsunami aftermath. Bookmark the permalink. Pingback: Procrastonaut: Halloween is coming!